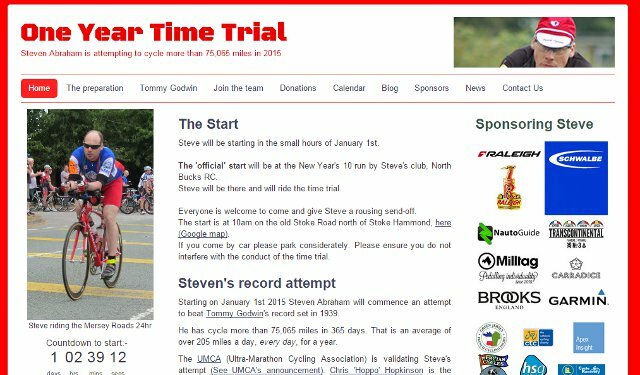 A Happy New Year to Steve Abraham as he sets off to break the world annual mileage record – either the craziest or greatest ride in history! On January 1st a British cyclist called Steve Abraham sets off to attempt one of cycling’s most challenging records. He aims to ride more than 75,000 miles in a year, breaking a record that has stood since 1939. He needs an average mileage of 205 miles a day, every day. If he misses even one day he then has to get that mileage back in future days. The record has for many years been regarded as almost unachievable. If nothing else the sheer mental task has scared potential candidates, but there is the need to stay fit and healthy every day for the whole year while putting that stress on the body. It is four times further than the cycling round the world record. There is even a suggestion that the Guinness Book of Records regards the record as too dangerous and discourages other attempts. Since 1939 many have considered it, a few have tried and only one man got there but his record was annulled because of concerns over validity. Tommy Godwin set the current record in 1939. He rode a heavy steel steed with just four gears and towards the end of his ride he had to carry on at night during the blackout of the early months of the Second World War. He also carried on to be the fastest man to reach 100,000 miles. So a modern rider with a lightweight bike and modern smooth roads should have huge advantage, even if our roads are more clogged by traffic lights and other bothersome features. But anyone taking on his record is not just racing the milometer, they are chasing the mythology of a man regarded as one of the hardest men ever to ride a bike, supposedly winning his first race at the age of 14 on a butcher’s bike. He is one of the most prolific mile-eaters in the community of long distance riders represented by the form of riding called Audax or randonneuring. He already has a year where 25,000 miles were chalked up in recognised Audax UK events, the record number ever recorded, while holding down a full time job. This means he has regularly completed rides of over 1000km, riding through the night. So when it comes to the long summer days when he will need to build up a lot of distance Steve is one of the most experienced riders around. My mind just boggles at the prospect. And I say very quietly to my friends and family “Its Ok”. You know whenever I see a great cycling challenge I say “Wow, I’d love to ride that”? No. No, no, no, no. Not this one. Not ever. I have every respect for the incredible distances Steve has already chalked up, they are unimaginable to the average person in the street. But this could just be the maddest, most crazy, daft challenge possible. Or the greatest. Like most others I will be watching from a distance, quietly crossing my fingers and wishing him the most extraordinary luck, because in terms of health, safety, weather and fair winds he is going to need it, even if he has the personal fortitude to do the record. In these days of social media and on line coverage every mile of success and failure will be laid out for all to see, a huge burden. And yet because of that it can be also one of the greatest achievements in cycling. Happy New Year Steve Abraham. This entry was posted in Uncategorized and tagged Audax, cycling, New Year, Record attempt by kevinmayne. Bookmark the permalink. Steve will do it. I remember him on CTC rides in Herts DA when I was the runs sec. And being an Audax rider he will never give up. Good luck Steve and I expect to read about you in the National Press and see you on TV. Yes, he certainly seems to be the best qualified rider around. I think my best ever year would be about 7,500 and I ran out of steam in September – so cannot really grasp it either. I think Tommy Godwin had to stop and get witnesses, but in those days there was probably a village policeman on every corner. Steve Abraham has I think got permission for GPS tracking, at least for some validation. But both can chose their own routes, as they wish. I was smug with 2,000 miles this year. That’s less than 2 weeks for him !!!! I am rooting for him ! happy new year, I’ve enjoyed your posts. I cycled in to work today, -15 f wind chill. have a great cycling year! Now that’s a cool machine – very impressed. Boyfriend with taste? Best wishes for the new year and thanks for all the comments in 2014.